The #IPASOCIALWORKS project has been working for the last two years to establish best practices in how to measure the impact of social media campaigns. Most people accept that the measurement of social needs something more insightful than the counting of likes, tweets, and shares. Under Fran’s guidance the project has produced the best collection of peer reviewed case studies looking at social media campaigns, establishing and demonstrating their ROI. You can access the case studies here. 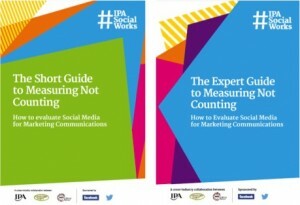 The project has also produced a substantive report on the measurement of social campaigns, edited by Fran, Simeon Duckworth, and Ray Poynter. You can read more about the Guide here. In the webinar Fran will review the lessons learned by the project, the key findings from the case studies, and provide recommendations on the evaluation of social media campaigns. Fran Cassidy has had over 25 years’ experience in the marketing sector- in agencies, as a client, and as a media owner. For 12 years she was Marketing Director of Carlton Television, part of the ITV network. She has also been Head of Marketing for major Outdoor and Cinema advertising companies. For the last 10 years she has run an independent marketing and research consultancy specialising in on line and off line media, marketing services and the entertainment sector, across Europe but also in US, Asia and Latam. Fran is also a Board Director of The Marketing Society in the UK. She also regularly chairs professional development courses for the European Group of Television Advertising Companies (EGTA) and has worked on the #IPASocialWorks project – the subject of today’s presentation – for over 18 months.